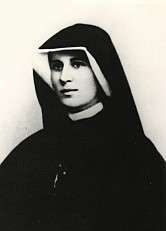 Diary: Divine Mercy in My Soul is a book by Faustina Kowalska, now a Roman Catholic saint . The book is based on the contents of her diary from 1934 until her death in 1938. The handwritten pages of Kowalska's diary turned into about 700 printed pages which were published as the book Diary: Divine Mercy in My Soul. The book reflects her thoughts, prayers and her reported visions and conversations with Jesus on Divine Mercy. Kowalska's Vatican biography quotes some of her reported conversations with Jesus from her diary.